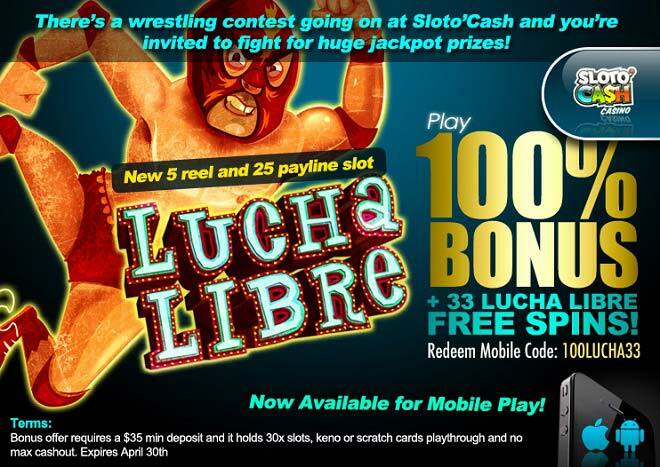 Experience the excitement of Lucha Libre, the newest slot 5 reel and 25 payline game to join the Sloto’Cash selection. Master your wrestling moves, as you get ready to collect huge prizes! Land fun characters such as the Wild Wrestlers, Taco Malo and Guacamolio, who can either double your prizes or jump onto at least one more reel when making an appearance in all positions on Reel 3. Get ready to pin your opponent to the mat with your chance to pick moves like the popular "Spanko Especial", "Supremo Foot of Fury", or the "Thunder Clap Bam Bam"! Win Free spins and Re-spins when you land 3 or more of the Scatter Mask symbols and trigger the 'Mask of Fiery Doom Re-Spins'. Lucha Libre features other fun images on the reels including the commentator, a television, a bottle of beer, a wrestling ring, and many more! It’s time to perform your favorite wrestling moves as you welcome Lucha Libre to Sloto’Cash and claim a 100% Match + 33 Free Spins. Let the intensity inside you come out as you fight on the ring for some huge winnings! Game and offers will be live on April 20th!